A couple of weeks ago I experienced a revelation: I tasted my first pea shoot. I was at the Little Italy Mercato buying Asian produce from The Vangs, also known as Mr. and Mrs. Green. After purchasing Thai basil, fresh ginger and sugar snap peas, I asked, "What do pea shoots taste like?" She replied, with no sarcasm, "Peas." She tore a small piece off one of the leaves and handed it to me. I bit into it and suddenly the sun broke through the clouds, harp music began playing, and I floated ever so slightly off of the pavement. OK, that's not exactly what happened. There was no harp music. It was Spanish music being played by a local band. 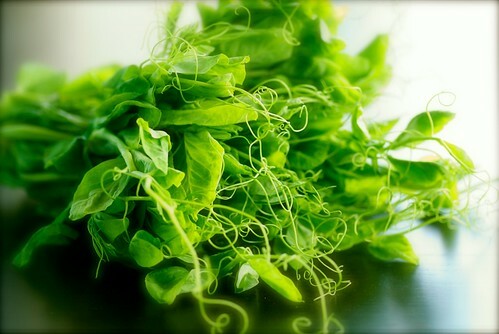 Pea shoots are the leaves and tendrils of pea plants, usually sugar snap peas. But they're so much more than that. With their celery green leaves and wispy curly cues, they look like Nature's wedding bouquet. As for the taste, Mrs. Green was right. Peas shoots taste just like fresh English peas -- refreshingly crisp and somehow both sweet and grassy. Pea shoot season is frighteningly short, lasting only three to four weeks, so when you see pea shoots, buy them. It can start as early as April or as late as June depending upon where they're being grown. Here is San Diego, we're nearing the end of our season because pea shoots can't survive the heat. Fortunately, they'll return for a short time in the fall. Where can you buy pea shoots? Try farmers' markets first then organic and specialty markets. Look for fresh, brightly colored, crisp bunches void of yellowed stalks and leaves. If you can't find them, ask the produce manager at your local market if they're available. How do you store pea shoots? Place them inside a brown paper bag, or wrap them with paper towel, and place in the crisper drawer of your refrigerator. They should last 2 to 3 days. How do you cook with pea shoots? First, cut off any yellowed or thick stems, then tear into small pieces. Eat them raw by tossing them into salads or eating them out of hand. Like most greens, pea shoots can be steamed, boiled, sauteed and stir-fried. Whichever cooking method you choose, be sure to cook the pea shoots quickly and lightly; you just want to wilt them. 1. Saute lightly in extra virgin olive oil, and douse with fresh lemon juice and a sprinkling of salt and pepper. 2. Saute lightly in sesame oil and crushed garlic, and sprinkle with toasted sesame seeds and cayenne pepper. 3. Add to warm pasta with extra virgin olive oil, fresh lemon juice and zest, grated Parmesan cheese, and cracked black pepper. 4. Toss into scrambled eggs with grated Parmesan cheese and salt and pepper. 5. Add to soups such as a gingery Asian chicken noodle. 1. Toss pea shoots, sugar snap peas, and orange segments in a medium bowl. 2. In a small bowl, whisk remaining ingredients. Taste and adjust as necessary. Pour over salad, toss well and serve. Variation: Add sauteed shrimp or scallops lightly sauteed in sesame oil. Tatsoi, a tasty Asian green in the cabbage family. Mizuna, a bold Japanese mustard green. Such a gorgeous salad! I was just in the farmer's market befuddled by pea shoots. Now I need to run back and get them so I can try this! I agree, love pea shoots. I am actually growing them right now so I can have them super cheap. Well I've yet to see pea shoots at the farmer's market so I either missed it somehow or it's still in store for me! I will definitely be seeking them out now that I have this recipe to make with them! There's a small hole in the wall restaurant in chinatown that I go to every time I'm there and while I normally like to experiment and try new things, I always get the same two dishes when I'm there. I get their salted soft shell crab, which is by far the best thing ever invented, and I get their garlicky lightly stir fried pea shoots. Pure nirvana. If you come at a slow time, you'll catch the chef (a tiny old Chinese woman) sitting at one of the round family style tables covered with a giant pile of the green shoots, sorting and tearing them into pieces. Now I'm hungry and your salad looks beautiful! oh i love pea shoots. and not just a pretty face, tasty too. really nice dressed with lemon and olive oil over a risotto. laura-Ha! Here's to no longer being befuddled! Enjoy the pea shoots. joanne-They can be hard to find, so you might need to do some hunting. But, trust me, they're worth it. anna-That restaurant sounds delightful. Don't you love when you see the "little old lady" cooking in restaurants? Whether it's the Mexican lady making tortillas, the Italian lady rolling pasta or the Chinese lady tearing pea shoots, you just know you're in for an amazing meal. misslion-Ah, yes, they're lovely in risotto. Thanks for adding that. oh yay! I recently had pea shoots as a side salad at a lovely restaurant in Portland. I am excited to see you showcasing them here - I can't wait to try it! Sunday Farmer's Market ~ here I come! great tips! i will have to try these! sometimes i like to "let the vegetable speak" and try them first w/ olive oil, salt and pepper first. I do like the imaginary harp music though. I always said if i were to play an instrument it would be a harp...until i learned that it would cost me $1000 to own one. A farmer up the road from me sells pea shoots at this time of year. It always feels like such a treat when I manage to snag some from her. joanna-Oh, the Portland farmers' market is wonderful! Have fun! lydia-I know what you mean. They just make me feel happy! I just realized how incredibly lucky I am. My local farmers market (Falls Church, VA) has pea shoots nearly every week. They must be growing them in a greenhouse. I love them in a salad with butter lettuce, chopped peaches, and curried viniagrette dressing. Did you know they can grow indoors all winter long in a sunny window? Treat them like a cutting lettuce, though eventually they will get too tough, and then you can start anew. You can of course cook the tough ones down and use them to fill ravioli or make a curry, etc. I have two varieties going outdoors at the moment (we've had a very cool spring which has helped extend the season)and truthfully, the packet I bought for .10 cents at the hardware store is doing better than the heirloom packet that cost near $5.00. Go figure. fgf-I hear ya. Unless you can get them locally grown, you risk aged shoots. donna-You are one lucky lady! Peaches and curry vinaigrette? Ooh, that sounds lovely. Maybe FGF needs to visit Falls Church! goody-No, I didn't know that. What a great idea-- economical and delicious. Thanks so much for sharing that with us. I'm sure a lot of readers will take your advice. Really beautiful pics and post. Can't wait to try some pea shoots now. Wish i could go out to the market NOW! better yet, wish i could grow them! but i'd surely kill them. Very nice, thank you. I will share the link on facebook.com/TheLunaCafe. According to a local farmer, pea shoots will be available in the Northwest in a few weeks. I'm so in love with pea shoots now. Thanks for including me in the roundup! I just had pea shoots (purchased to garnish fresh pea soup) and they ended up in a salad. I didn't know you could cook them. Love your salad idea. Susan - This is one of my two favorite type of posts in your blog: farmer's market finds and RI Italian food. Different than what I find anywhere else. Love pea shoots and really enjoyed reading about this salad recipe...I can't wait to try this! I'm one of those readers! Goody, thanks for the tip! My peas are just flowering and I was so excited that we'll be eating them soon. I had no idea that we could be eating them NOW! I'm almost as excited by this as I was about our rapini... almost. peggy-Good luck on your hunt! shef-I hear ya, sista. I kill everything too. lunacafe-I just came back from Seattle, and I didn't see any. But Idid see lots of ramps and fiddleheads. angela-Now you know! Just be sure to cook them lightly. Enjoy! Mary-How sweet of you! Thank you kindly. And as for the FM finds, I adore them! juliana-Isn't it wonderful how much we can learn from one another? And rapini? Oh, I just love rapini. You're really lucky! I always have some peas growing in my spring garden, and have wondered about using the shoots. Thanks for such an informative post. Also just wanted to let you know that I just reviewed your wonderful Encyclopedia of Sandwiches on my blog. Great job all the way, but I especially love all the interesting facts and foodie lore in your introduction to the recipes. Made a few sandwich recipes from the book and hubby enjoyed a nice Tofu Reuben on a gluten-free roll and thanks you too for the sandwich inspiration!